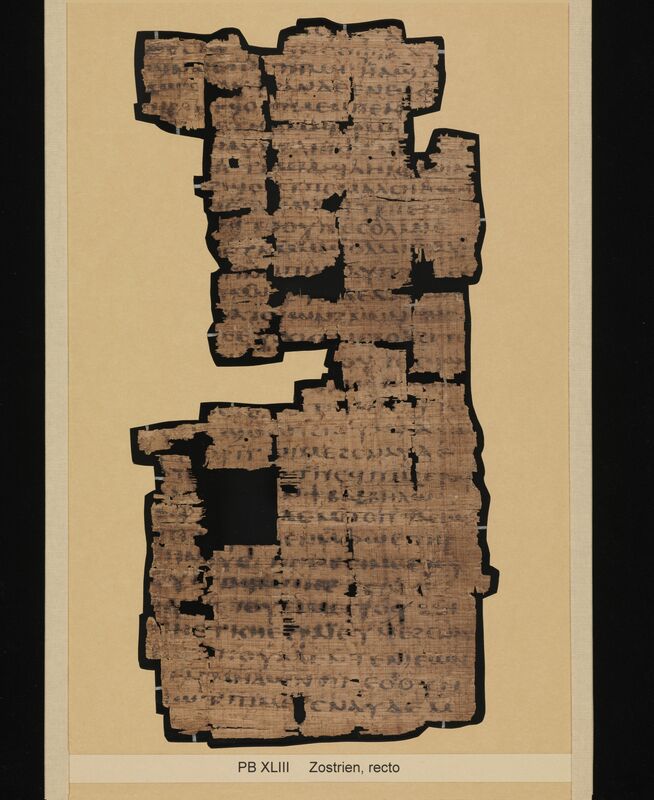 A folded papyrus leaf from a codex containing Zostrianos in Coptic (Sahidic). 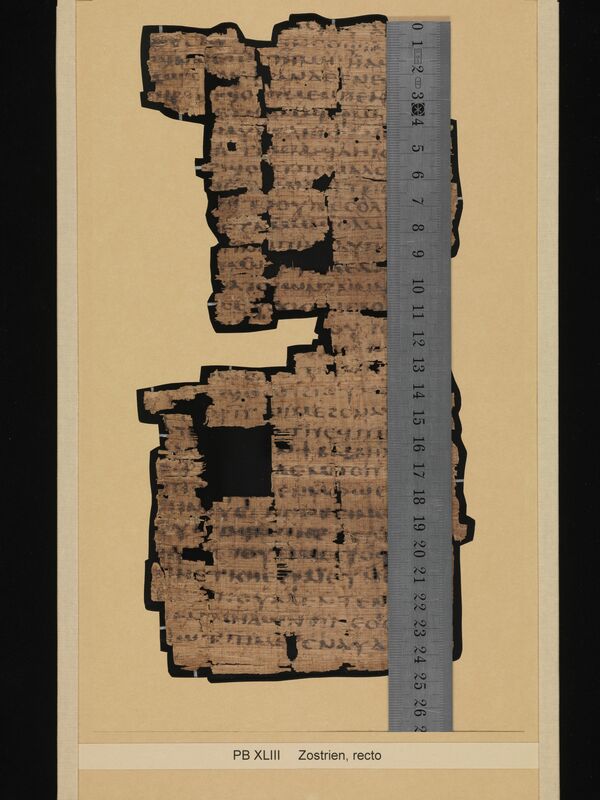 Description: P.Bodmer 43, a papyrus leaf from a codex containing the work known as Zostrianos, shows clear signs of having been folded several times, which suggests to the editors that it may have been used as an amulet. Based on the assumption that, since this text begins and ends so abruptly, it must have once been part of a codex and not originally designed as an amulet, Kasser and Luisier attempt to estimate the size of the original codex. 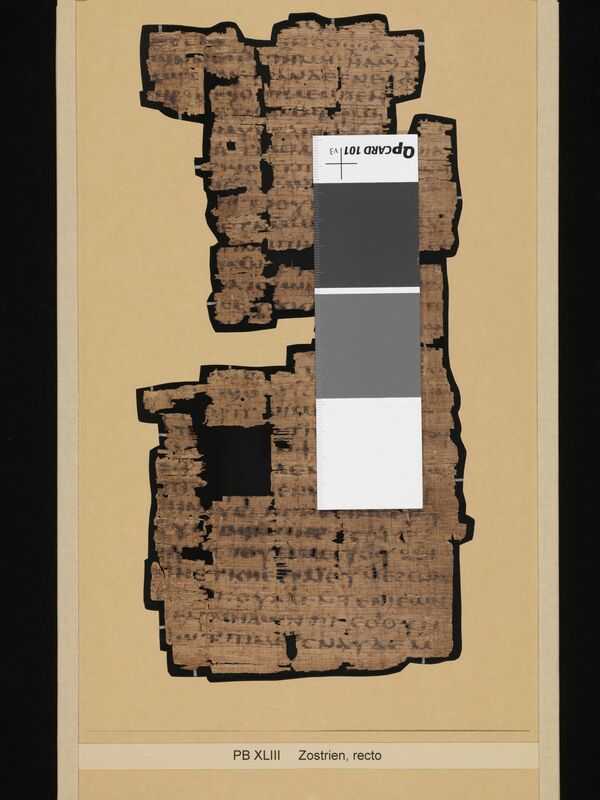 Based on the size of the parallel text of Zostrianos found in the Nag Hammadi Codex VIII, they estimate that this codex would have been 111 pages, and this leaf would have been page 99/100 or 100/101. CopistesThe leaf was inscribed by a single copyist writing in an upright irregular majuscule (Kasser and Luisier, “P.Bodmer XLIII,” 253). Dimensions: The width of the page is 12.1 cm. The height of the page is 25.0 cm. The ratio of the page (width/height) is 0.484. 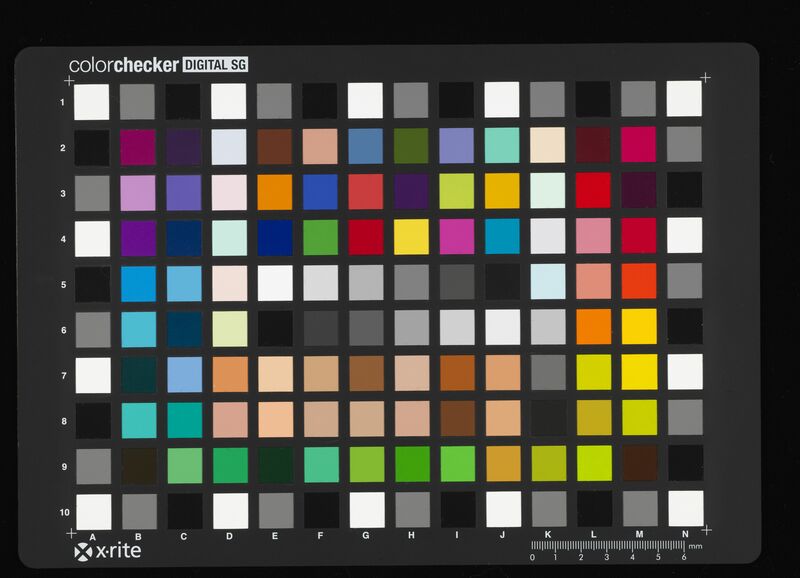 The writing is in a single column per page. The width of the written area is about 11.5 cm. The height of the written area is about 24.1 cm. There are 32 lines per page on the single extant folio. Quires: There is insufficient data to determine quire structure. Paratextual features: The only punctuation used on this leaf is a single dot. RésuméA folded papyrus leaf from a codex containing Zostrianos in Coptic (Sahidic). Kasser, Rodolphe and Philippe Luisier. “P.Bodmer XLIII: Un Feuillet de Zostrien.” Le Muséon 120 (2007): 251- 272.